Hillside Treasure will be a great cache for kids......all because of the hike & SWAG. 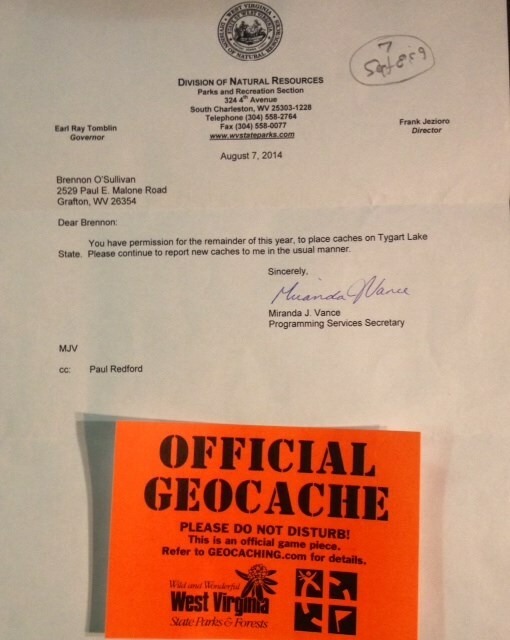 The goal for this cache is to encourage hiking......not difficult searching. Park regulations prohibit searching for caches between 10:00 p.m. and 6:00 a.m. The area is patrolled 24 hours a day. Therefore, this should be a safe, family friendly caching adventure. This cache requires a short out and back hike on one of the park's trails. As the name suggests, the initial hike is all up hill. Once you near the cache, you will depart from the trail (UP hill) aproximately 40 yards to the CZ. After you find the plastic ammo can, it's all down hill for your next adventure. PermissionThis attachment is the permission form to place a cache on this park.